You know Walt Disney World for its thrilling attractions, fun family rides, nighttime spectaculars and amazing restaurants. But did you know that Disney is also the leader in live entertainment, including stage shows and musicals? 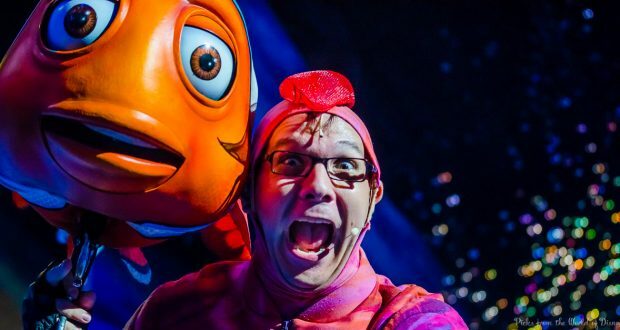 Look no further than Animal Kingdom for one of the best musicals in all of Walt Disney World—Finding Nemo—The Musical. Relive the story of Nemo’s capture by scuba divers, Marlin’s quest to find his son and the lovable Dory and her forgetfulness. If you’ve never stopped in to the Theater in the Wild at Animal Kingdom for this stellar production, make plans to do so when you next visit Animal Kingdom. Here are 8 totally cool reasons why. 8. The show has a prestigious director. One of the reasons this musical is so spectacular is that Disney got the right man for the job of directing. Tony Award-winning director Peter Brosius plays the role of director for Finding Nemo—The Musical. Brosius is well known for his work as the artistic director for Children’s Theater Company in the Minneapolis/St. Paul, Minnesota area. 7. You’ll recognize the talent of the musical composers. 6. Magnificent puppets tell the Finding Nemo story. We aren’t talking sock puppets or anything like them! There are lots of puppets used in the musical, and each is a vibrantly-colored, exquisitely detailed work of art. Some are controlled with long wooden poles and others are simply held by camouflaged puppeteers. You can barely see the puppeteers—the puppets keep your focus on the story and help to bring the story of Nemo to dazzling life! You’ll see Marlin, Nemo, Dory, Crush, Nigel the pelican, Bruce the shark and more! 5. The puppets’ designer is well known too. Not only does Finding Nemo—The Musical boast a famous director and famous composers; it also boasts a very well-known puppet designer. The puppets used in this musical were created by Michael Curry. Curry was responsible for designing the elaborate puppets used in the Broadway version of The Lion King. 4. Some of the puppets are huge! Not only are the puppets beautiful works of art—some of them are massive! Crush, the sea turtle that loves to hang ten, is the size of a Volkswagen Beetle in his puppet form. And Nigel the pelican is 22 feet tall! 3. You’ll believe you’re underwater. Thanks to the backdrops, props and other special effects, you’ll have a hard time remembering that you’re sitting in a theater at Animal Kingdom! You might even find yourself holding your breath because you just know you’re underwater with Nemo and all his friends. 2. The musical is award-winning. Finding Nemo—The Musical opened to Guests at Animal Kingdom in 2007, and it didn’t take too long for it to win an award. In 2009, the musical won the THEA Award for Best Live Show. Congratulations! 1. You’ll be humming a song you heard at Epcot. Chances are you’ll find yourself humming many of the tunes you hear during the show, and a Guest favorite is “Big Blue World,” which is the opening number for the musical. It’s catchy, and all the characters sing parts in it. But if you visit Epcot before you visit Animal Kingdom and take in the Finding Nemo attraction in Future World, you’ll hear “Big Blue World” at the very end of the cute clamshell ride inside The Seas with Nemo and Friends pavilion.